Actress and model, Pace Wu (吳佩慈) attended Jean Paul Gaultier fashion show held during the Paris Fashion Week in Paris, France on September 29, 2012. Pace Wu (吳佩慈) wore a suit-ensemble from Jean Paul Gaultier Fall/Winter 2012 collection. Hot pink accessories which consists of a belt, Olympia Le Tan 'Love Story' book clutch and Brian Atwood 'Maniac' in pink suede to complete her look. The following day, she attended Kenzo Spring/Summer 2013 fashion show held at Maison du Judo in Paris, France. 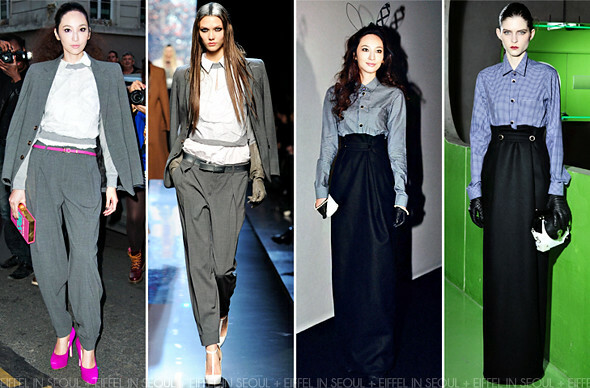 She wore a look from the label's fall/winter 2012 collection. A pair of bunny ears, leather gloves with pearl embellishments and the same clutch seen on the lookbook to match her outfit.